Welcome to Firesmith’s Wand Shoppe where I sell my one-of-a-kind hand-crafted magic wands made from the finest magical wand woods and mystical crystals. Currently, I am making wands from azalea, birch, cherry, ebony, holly, honeysuckle, lignum vitae (iron wood), maple, mahogany, olive, pear, poplar, oak, walnut, and willow. I also craft each wand with fine mystical crystal gemstones including amber, amethyst, black moonstone, black onyx, citrine, emerald, garnet, fire opal, lapis lazuli, peridot, rock crystal, rose and smoky quartz, ruby, blue and pink sapphire, blue and white topaz, and white moonstone. Finally, each wand is stained and protected using natural teak or tung oil and hand rubbed to a smooth finish. I neither make nor sale mass-produced wands molded from petroleum-based plastics or resins. I would also be happy to craft a wand to order from other magical woods and mystical crystals on commission. 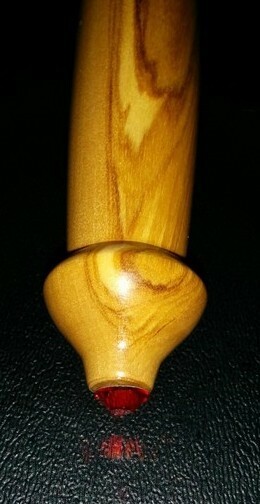 For example, this is one of my personal wands that I hand crafted from olive wood. 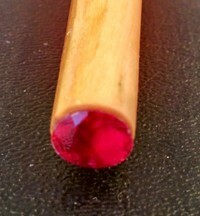 It has a large 1.6 carat ruby tip and a Mexican fire opal end cap. SALE! This book is currently on sale for $14.99 (regularly $19.99). I carefully craft each of my wands in accordance with the classic but ever popular magic school textbook Magical Wands - A Cornucopia of Wand Lore. 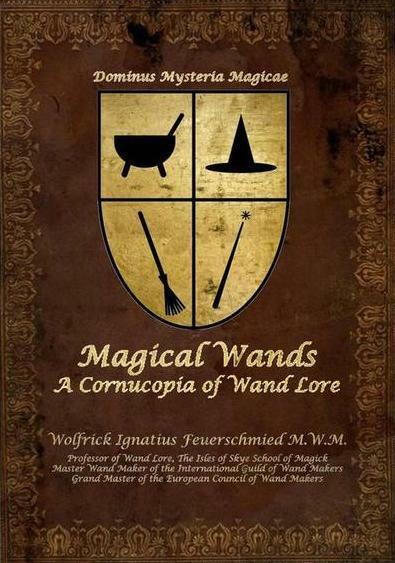 In the autumn of 2011, this book by Wolfrick Ignatius Feuerschmied, Professor of Wand Lore at the Isles of Skye School of Magick was accidentally left by a young student on a Scottish train and fortunately found by a professor of British Literature who recognized its significance. Although the professor went missing shortly thereafter, his estate granted permission for its publication, and it has been lovingly reproduced to match the original from cover to cover. In addition to buying one of my fine wands, you can also read selected parts of this book so that you will better understand the differences between the different wands and thereby select one that is appropriate for you based on your needs and excels at strenthening and focusing the types of spells you wish to cast your new wand. If you would feel safer shopping at a major well-known on-line eMarketplace, consider buying my wands or book from the Firesmith Wand Shoppe on Etsy.